Cairo: Egypt’s cabinet said it had resigned amid deadly clashes between police and protesters demanding political change that have killed 26 and prompted the ruling military to call for crisis talks. On the eve of a new wave of protests planned for later Tuesday, the cabinet announced its resignation on the third day of protests that have triggered Egypt’s worst crisis since president Hosni Mubarak was toppled in February. Two people were killed early Tuesday in the Red Sea town of Ismailiya, medics said, bringing the toll of clashes since Saturday to 26. “The government of Prime Minister Essam Sharaf has handed its resignation to the (ruling) Supreme Council of the Armed Forces," cabinet spokesman Mohammed Hegazy said in a statement Monday. Sharaf’s resignation, if accepted, threatens to derail parliamentary elections scheduled for 28 November - the first polls since Mubarak’s downfall. The Supreme Council of the Armed Forces (SCAF), which took power when Mubarak was ousted, “invited all the political and national forces for an emergency dialogue to look into the reasons behind the aggravation of the current crisis and ways to resolve it as quickly as possible," it said in a statement carried by MENA. It said it had asked the justice ministry to set up a committee to shed light on the violence, and called on “all forces and citizens to commit to (restoring) calm, and creating an atmosphere of stability with the goal of pursuing the political process." Amnesty International charged that Egypt’s military rulers had failed to live up to their promises and had even committed worse rights abuses than the Mubarak regime. Tens of thousands of people packed Cairo’s iconic Tahrir Square on Monday night, after clashes continued for a third straight day between protesters and police in and around the square. They greeted news of the cabinet’s resignation with indifference, calling for the removal of the military rulers as clashes continued around the nearby interior ministry headquarters. Riot police fired volleys of birdshot, rubber bullets and tear gas at demonstraters who used stones and petrol bombs. Other protesters formed a corrider through which the injured were ferried into waiting ambulances. The United States said it was “deeply concerned" by the violence and White House spokesman Jay Carney said it was important that US ally Egypt move toward democratic elections. US State Department spokeswoman Victoria Nuland echoed the White House call for “free, fair elections," and expressed the hope the electoral process would remain on schedule. UN leader Ban Ki-moon called on the military council to “guarantee" civil liberties as he deplored the deaths in the clashes. 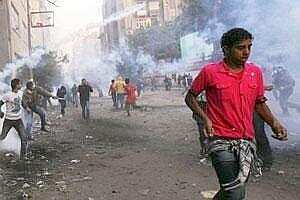 “The secretary general is deeply concerned about the violence in Egypt during the last few days, particularly in Cairo. He deplores the loss of life and the many injuries," said UN spokesman Martin Nesirky. “The secretary general calls on the transitional authorities to guarantee the protection of human rights and civil liberties for all Egyptians, including the right to peaceful protest." Political forces behind the uprising have called for a mass rally on Tuesday to demand that the army cede power to civilian rule. The Coalition of Revolution Youth and the 6 April movement, among others, have called for the protest at 4:00 pm in Tahrir Square, the epicentre of rallies that ousted Mubarak. In a Facebook page for the rally, the groups called for the immediate resignation of Sharaf’s cabinet and the formation of a “national salvation" government. They also demanded a presidential election by April 2012 and a complete overhaul of the interior ministry. The Muslim Brotherhood, Egypt’s best-organised political force, announced it would not take part in Tuesday’s mass demonstration. The Brotherhood-affiliated Party of Freedom and Justice announced on its website late Monday that the decision stemmed from its “desire not to pull people towards fresh bloody confrontations with the parties that are seeking more tension." As clashes erupted on Tahrir square, fighting also broke out in the Mediterranean city of Alexandria, state television said. Hundreds have been injured during the protests that have raged in Cairo, Alexandria, Ismailiya and the canal city of Suez. Culture minister Emad Abu Ghazi earlier quit in protest at the government response to the demonstrations, he told MENA. Egypt’s stock exchange tumbled 4.04% on closing on Monday, with the main EGX-30 index dropping 3,860.00 points. Arab League chief Nabil al-Arabi called for calm and urged all political forces to press ahead with the democratic process. He urged them “to work for calm and return to the political process and move forward with the process of democratic change based on the principles of freedom, dignity and social justice on which the January 25 revolution was founded." The clashes first erupted on Saturday, a day after large crowds staged a peaceful anti-military mass rally at the square, resuming on Sunday and carrying on through the night into Monday. There were heavy clashes on side streets leading to the interior ministry as protesters chanted “The people want to topple the field marshal" - Hussein Tantawi, Mubarak’s long-time defence minister who heads the SCAF. The SCAF, in a statement read out on state television, said it “regretted" what was happening and said it was committed to the elections timetable.